For all the rhetoric in recent weeks, the sudden turmoil in emerging markets really boils down to one simple thing: a strong dollar; or put more specifically, the stronger the dollar and the faster its appreciation, the greater the EM turmoil. This is shown simplistically on the following chat mapping the inverse correlation between the strong dollar and the Emerging Market debt index. 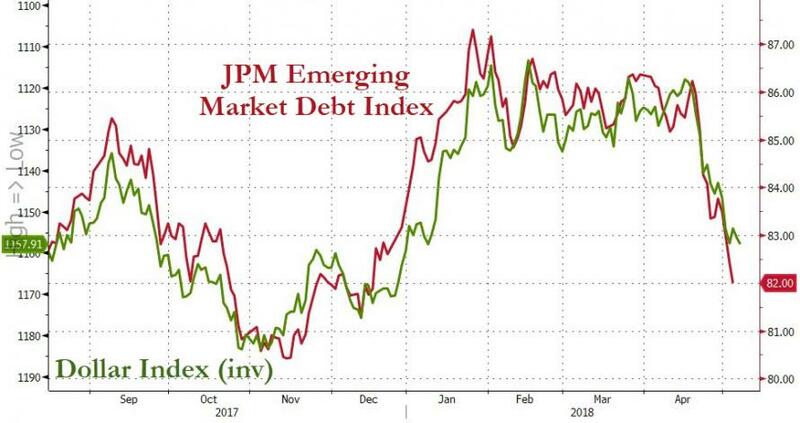 Just as important is the catalyst behind the recent EM rout - i.e. USD strength - which as as we explained recently, was the unexpected Chinese central bank easing in the form of an RRR cut, a dovish capitulation which sent the dollar into orbit while slamming the Yuan, all of course in the context of the escalating trade war between the US and China: call it a preview of what China's retaliation will look like. 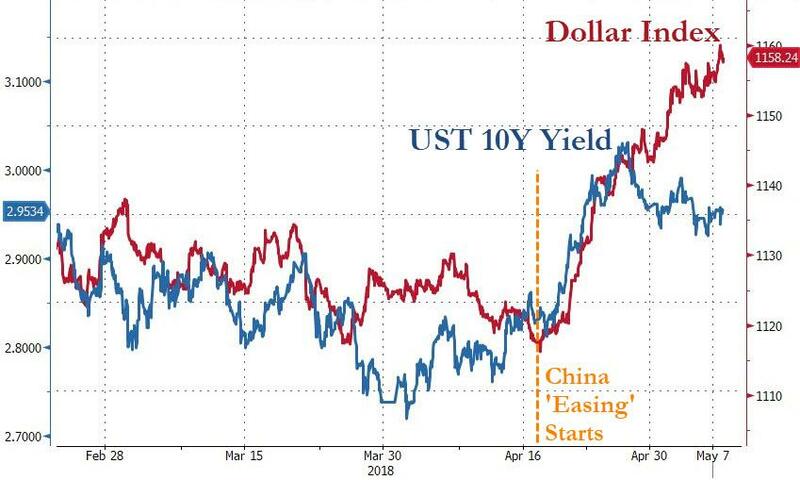 And with the dollar rally accelerating in the early part of the week when it hit a fresh 2018 high, only to fizzle in the last two days, it is hardly a surprise that investors started to get nervous. As a result, when looking at the latest EPFR weekly fund flow data, Bank of America found that while risk flows in the past week were at best tentative ($3.6bn inflow to equities, $0.6bn into gold, $1.2bn out of bonds), one category stood out clearly: emerging-market stocks and debt finally saw $3.7BN of outflows in week ending May 9, the most since December 2016. This is notable because it represents the first material weekly outflow since late 2017 even though Emerging Market equities had been hit several weeks earlier as seen in the chart below. It's probably obvious that should the dollar resume its rise - which now that rate differentials have recoupled would likely mean even higher yields - the EM turmoil would get worse, and outflows would accelerate. 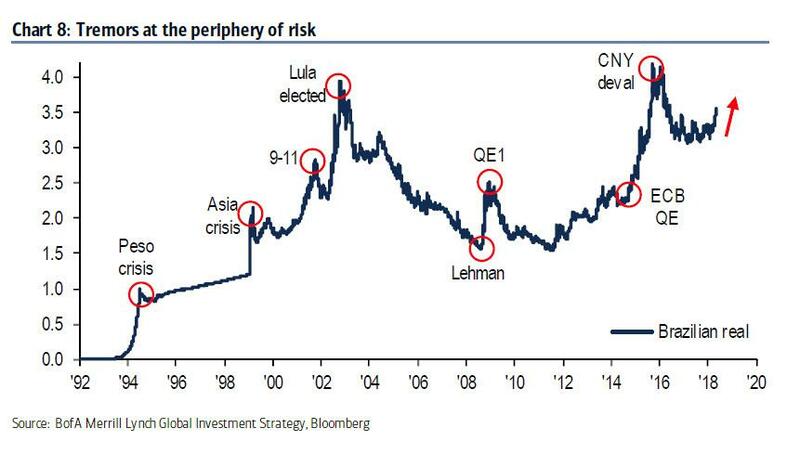 "EM FX never lies and a plunge in Brazilian real toward 4 versus US dollar is likely to cause deleveraging and contagion across credit portfolios." In other words, the best indicator of imminent emerging market turmoil is shown in the chart below: if and when the BRL starts sliding, and approaches 4, it may be a good time to panic. 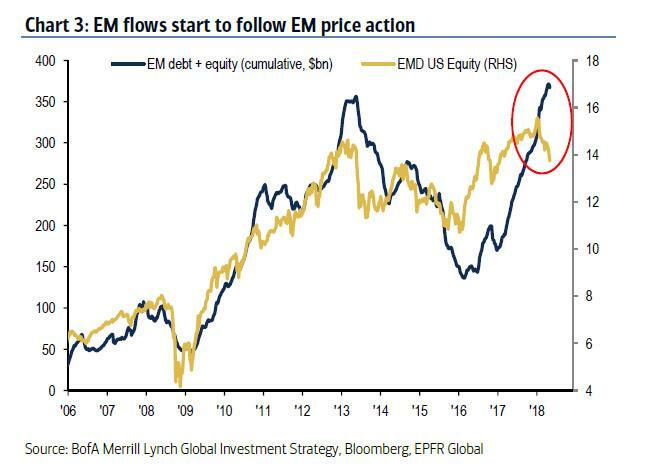 And, as he did earlier this week, Hartnett repeats that "BRL remains key EM risk-metric...closer to 4 it gets the more EM deleveraging and potential for global contagion." Finally, now that everyone realizes we are late cycle, what about that other trade that traditionally mirrors EM flows: commodities. 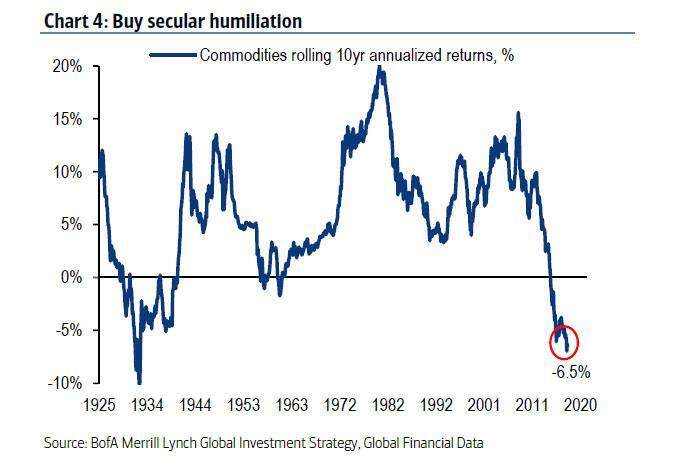 Here is Hartnett on why one should start buying "Secular humiliation": "Late-cycle oil: commodities late-cycle & only asset class bar cash suffering secular humiliation (10yr rolling returns = -6.5%, worst since 1930s – Chart 4)." 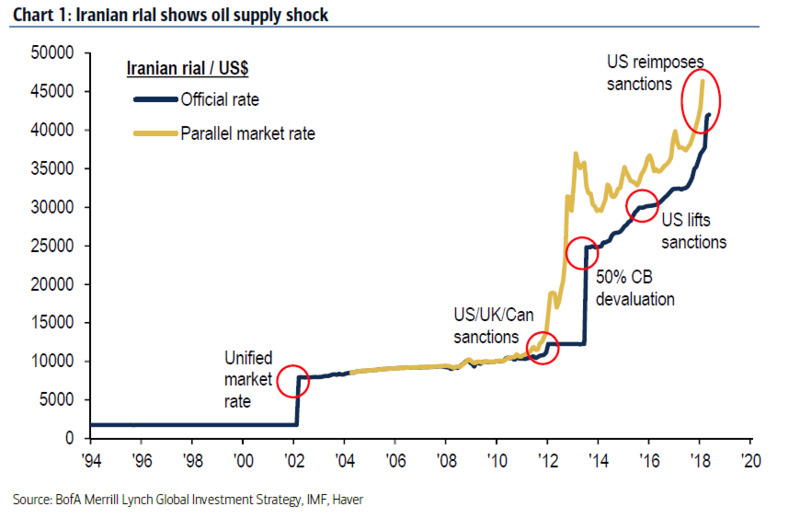 ... which together with BofA's oil price target of $100, is not reflected in energy fund flows.